I picked up a Le Strum kit from tindie. The kit is made by Jason Hotchkiss. He’s got some amazing kits. I also picked up an Arpie, but i’ll get to that one when I have time. 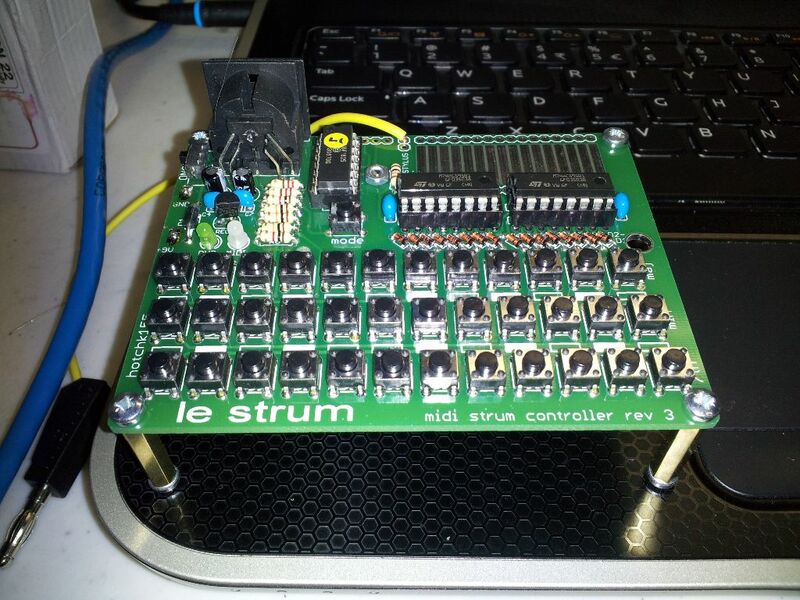 So what is Le Strum ? It’s a midi controller that generates notes by strumming. So what do you get in the kit ? Well a PCB board, a ton of buttons, a few ic’s and passives… etc. Everything needed to put the kit together. 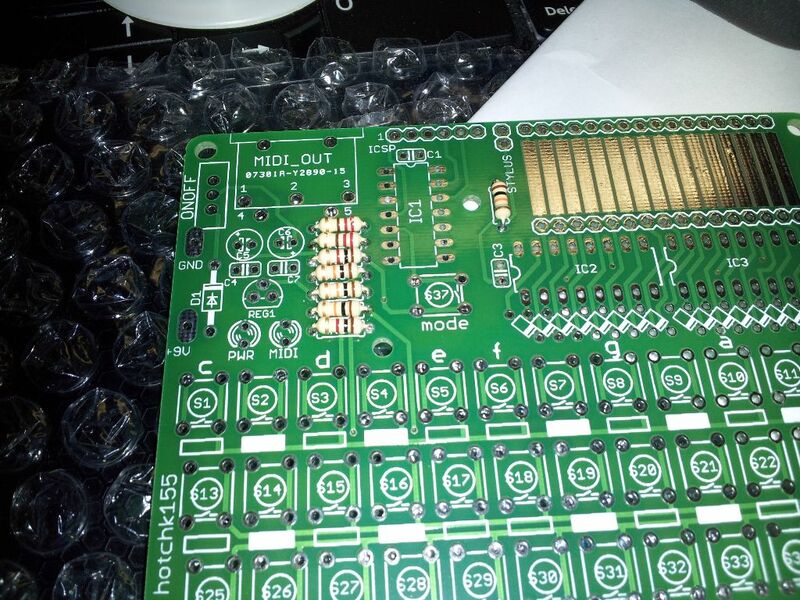 First thing to notice here, is there is a _lot_ of soldering to do. All the resistors, diodes, and buttons oh my! 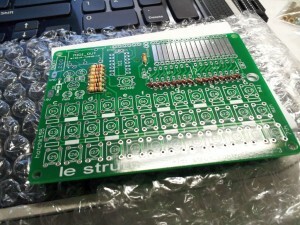 The instructions are pretty straight forward, hosted on github, no complications, put the resistors in, the diodes, caps, buttons, solder it all…. 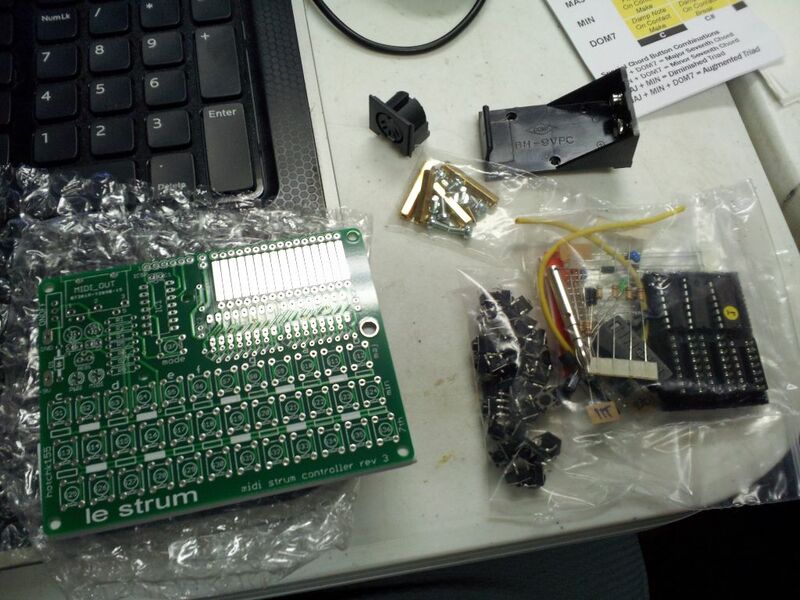 Assemble the strumming probe, power it on and rock out! Don’t forget to attach the legs in the correct order, I had the long and the short ones offset at first and it was odd… but that was quickly fixed. So powering it on for the first time. Everything looked like it could work — but I couldn’t get any audio out of it. I was using a USB-to-MIDI adapter and trying to get some music into Fruity Loops Studio but I wasn’t getting any midi notes. I started diagnosing the problem fearing i would have to disassemble the entire thing. 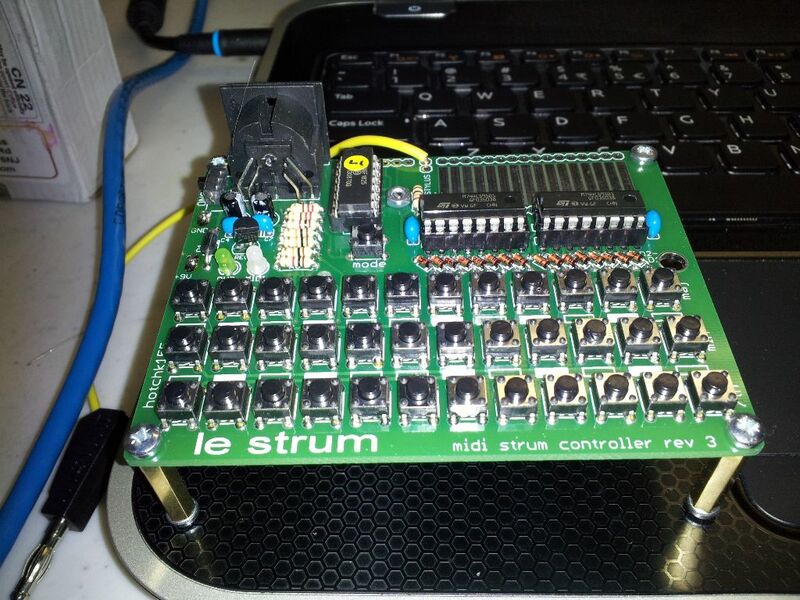 I grabbed an LED and shoved it into pins 4 and 5 in the midi port and verified there was some data being clocked out (despite there being a midi led on the board… I wasn’t sure if the led was wired to the actual traffic or just a gpio on the pic). So I had data clocking out but my USB-to-MIDI adapter (which I’ve used in the past) just wasn’t happy. 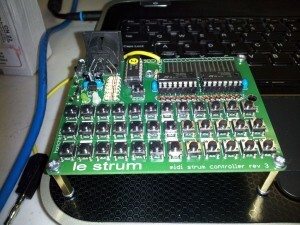 So I ended up hooking the Le Strum up to my MIDI controlled YM2149 that is technically still in beta. Surprisingly it worked fine with my board. 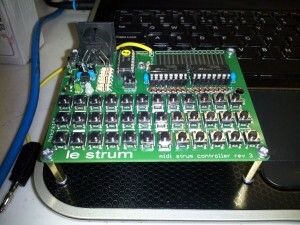 So it may be a cheap USB-to-MIDI adpater being picky about signal quality or clock skew. Good thing the kit comes with the quick reference card it was a timesaver. My YM board didn’t like the default setting of being on note-off but changing it to note-on and in 2 channel organ + strum mode it sounded awesome. Here’s a video of me strumming some chiptunes! So in closing, awesome kit. My only concern is the incompatibility with my cheap usb to midi adapter. Makes me wonder if other equipment will have the same issue. My next issue is the longevity of the strum pads, I feel they are going to wear out pretty soon and I’m very temped to just blob them with solder to keep them from wearing out. Here’s a closer up picture of the pads, they are just like large pcb pads — I guess we will have to see!